Superior Paint and Powder Coating offer a time-saving service to aluminium door, window and curtain walling fabricators by offering a Low Tack Protective Taping Service. When your polyester powder coated extrusions leave our curing oven and are ready for despatch to your works, let us protect them for you with quality and cost-effective low tack tape. The benefits of Protective Tape for aluminium extrusions. For your aluminium manufacturing operations, low tack tape has several advantages. Less time and labour needed when we deliver your material to protect it. Tape protection ensures your aluminium hits your production line faster. 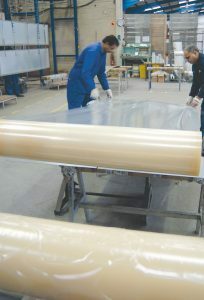 The tape stays on during fabrication, helping to protect the aluminium bars. You spend less time and money protecting the sections for delivery to your customers. The aluminium remains protected in commercial or residential installations where fabricated products are installed before site completion/handover. Professional protection and care of powder-coated aluminium. The application of low tack protective tape for your powder coated aluminium extrusions provides additional protection during transportation, especially for residential windows and doors where the end-user client can be more demanding in scrutinising the paint finish in their home. For commercial projects, you can reduce your site calls by installing your windows and leaving them suitably protected from damage by plasterers and other trades. We offer to tape to either aluminium sections, flat aluminium sheet, pressings and louvre panel frames. Best of all, we use quality tapes approved by the major powder manufacturers. Contact us today to find out how we can help speed up your production and offer your business quicker lead times, lower costs and improved efficiency, with our low tack protective taping service.